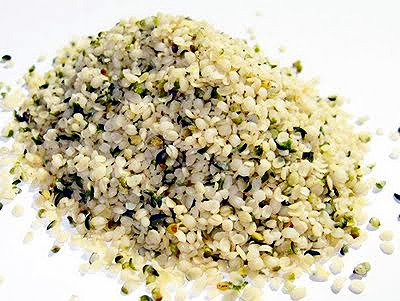 Hemp Hearts are a new food to love that will love you right back. Delicious topping oatmeal, cereal, yogurt, cottage cheese, salads, soups and ice cream, Hemp Hearts are a delightful change of pace from other nuts and granola that you may normally use and are delightful as a snack on their own. They are also a complete vegetarian protein, like soybeans and quinoa, which means that you can simply eat a serving of Hemp Hearts and have your complete protein served right up. HEMP HEARTS (shelled hemp seeds) are one of the Most Concentrated and Best Balanced Source of Proteins, Essential Fats and Vitamins in Nature. Of equal importance, these desirable nutrients are not accompanied in HEMP HEARTS (shelled hemp seeds)with an excess of carbohydrates, sugars, and saturated fats--nutrients which are already eaten in excess and which in the long term have proven to be challenging to human health. HEMP HEARTS (shelled hemp seeds) have been sold in increasing quantities through health food stores, health care professionals and especially to older individuals with chronic health problems. This product is priced and packaged to be eaten in quantity. The alleged health benefits of hemp hearts have not been proven through viable scientific studies. Many consumers who regularly eat hemp hearts have reported health improvements, but the effects have not been directly tied to what they ate. According to EnviroHealthTech.com, hemp hearts may improve circulation, alleviate inflammation, provide relief from chronic diseases, reduce cancer risks and control cholesterol levels. GreatHealth.org says that 1/4 cup of hemp hearts has about 15g protein, 2.5g dietary fiber, 4.5g carbohydrates and 15g fat, 2g of which is saturated. The seeds contain no cholesterol, are sugar-free and are suitable for people with allergies or sensitivities to nuts, gluten or lactose. One-quarter cup of hemp hearts has about 240 calories. While that number is high for a food that is traditionally used as a garnish or accompaniment, hemp hearts are full of calorie-rich essential nutrients, such as amino acids, omega-3 and omega-6 fatty acids. Hemp hearts can be used like wheat germ or flaxseed meal and sprinkled on cold or hot cereal, granola, yogurt or smoothies. HempHearts.com suggests pairing the seeds with fibrous vegetables such as spinach, carrots, celery, beans or sprouts and avoiding starches to combat potential digestive issues. Since they contain large amounts of protein per serving, hemp hearts can also be used as a meat substitute or a high-protein addition to a vegetarian or vegan diet. Before using hemp hearts to address medical symptoms or encourage weight loss, speak with a physician to get personalized recommendations and advice. Avoid eating too many hemp hearts at the expense of other healthy food groups, which also provide necessary nutritional benefits and are important parts of a well-rounded, balanced diet. USDA's MyPyramid recommends daily servings of nonfat dairy, whole grains, fruits and vegetables in addition to lean proteins.